Fishing for steelhead does not need to be a complicated as some anglers make it. Having a few basic steelhead lures in your arsenal is all your really need. ​Although a lot of people will stick to using natural bait for steelhead such a salmon roe, this kind of approach can and does limit your ability to hook a steelhead especially if it a stretch of water you have not fished before. If spinning from the bank is your game then you can't go wrong with an old reliable like the Blue Fox Vibrax. Kastmaster lure work great when fishing larger rivers as they are pretty heavy for their size. The classic colors such as gold, silver or the blue and chrome will work best. The nightmare jig is easily the best known jig for steelhead fishing. Although it does look rather odd it can be an absolute killer when worked under a float. ​Plastic worms fished under a float or drifted along the bottom are another popular option. There are a lot of different colors available however I have always found pink to be one of the most successful. If you are trolling the the Lure Jensen Kwikfish or Flatfish lures can force a large steelhead into striking. They have a very distinctive wobble and give out a lot of vibration when trolled. The best lures for steelhead will have some sort of wobble action or give off a vibration, that combined with some kind of flash like a gold or silver blade is what will force a steelhead to strike especially if you can get it right in front of their nose. Steelhead lure selection need not be that complicated. 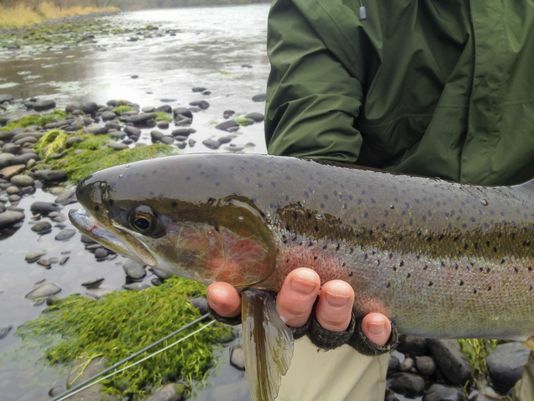 Before you tie on a lure it is important to think about what kind of water you are fishing and just where exactly will the steelhead be lying. Fishing steelhead lures can fall into two main approaches. Fishing more active lures on the retrieve like spinners/spoons and bait imitators like jigs/worms. Both types of lures rely on you working them across the river and being able to judge how deep the lure is fishing. Ideally you will want to have the lure bounce the bottom a few times. Casting is generally done in a large fan like pattern, across and upstream from you. Using a large fan like pattern allows you to cover as much of the river as possible. The name of the game here is to work the lure slowly. Cast across the water and slightly upstream in front of you, allow the lure to sink so that it may hit the bottom. Then start a slow retrieve. The retrieval rate should be just enough to keep the lure from hitting or snagging on the bottom. Steelhead will very rarely if ever take a lure that is several feet higher than them in the water column. Jigs and worms will generally require the use of added weight or a bobber to get the best distance possible. One of the best skills you can develop is learning to distinguish between a strike and you weight bouncing or snagging in the bottom. This unfortunately takes time and experience. The more natural the presentation the better. You are trying to imitate a nymph or sub-aquatic insect moving down river at the mercy of the current. Letting them drift naturally without any interference from your rod tip or line is key. Despite it's odd color combination fishing the Nightmare Jig for steelhead is one of the most effective ways to snag a trophy fish. So just what is it about these little jigs that make them so effective and what is the best way to fish a Nightmare jig for steelhead? ​Fishing a nightmare for steelhead usually involves working the jig to give it some life. 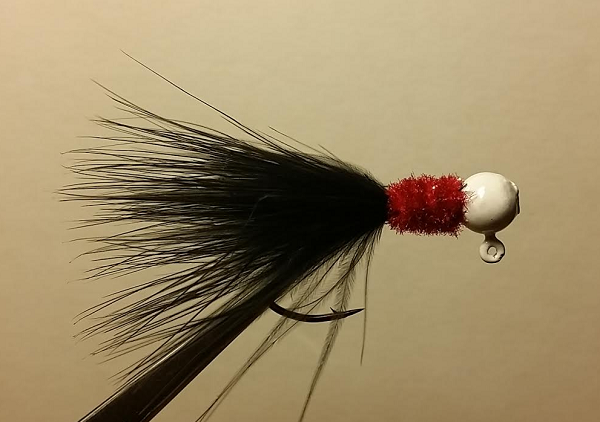 ​There are quite a few variations on the pattern of the Nightmare jig however, they mostly conform to what is described above. It appears that the contrasting colors of black, red and white seem to bring out a predatory instinct in steelhead. A lot of steelhead lures do still to plain colors such as silver or gold but they have the added advantage of a reflective material. With the nightmare however it really is the contrast between the colors. Why they strike them is not that important really. Learning how to present them is more important. ​Just be aware that the naming can be a little bit confusing. Some people will refer to drifting when they are actually talking about float fishing. They will use the term to "drift" their float down the river. The choice between either technique will usually come down to water speed and how deep the river is. In faster water it is best to drift the nightmare lure along the bottom. Whereas in slower moving water the better option is to use a float. Drifting is what can be defined as a bottom up approach to jig presentation. You can either add weight to the line several feet from the jig or use no weight and rely on the weight of the jig itself. When using weight the technique involves drifting the weight along the bottom. The unweighted jig is then free to move through the water in a much more natural manner. ​Without weight the jig is just cast on light gear and worked along with the current adding the occasional twitch to give it some life. Float fishing as the name suggest involves suspending the jig beneath a float or bobber. You can fine tune the depth at which the jig will run. It is easily the most popular method when fishing for steelhead with a nightmare jig. You can use either a fixed float or a slip float. The fixed allows you to fish at a specific depth whereas the slip float has the added ability or varying the depth. If you are just starting out then you may want to stick to the fixed float.